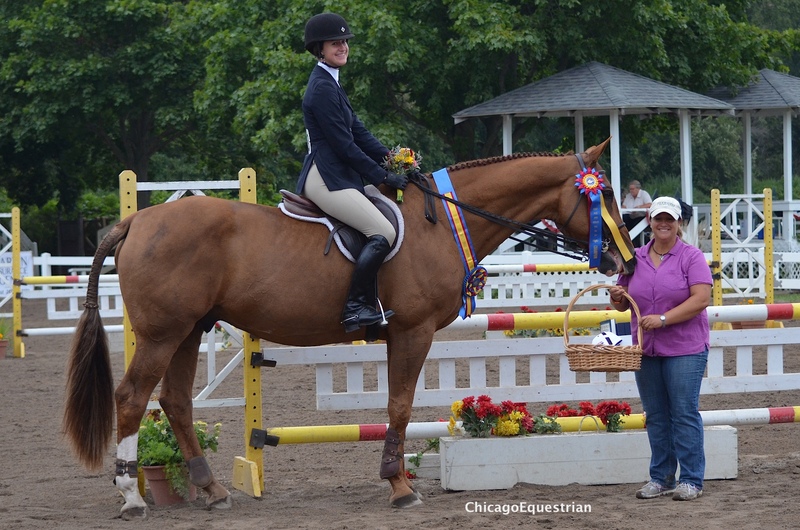 Hillary Marx won the Open Adult Medal and her horse Cohiba won the Best Equitation Horse Award. Temperance, MI – August 31, 2014 – The Michigan Hunter Jumper Association with Stoney Ridge Farm and Scott Alder, held the MHJA Medal Finals with the prestigious judges panel of the legendary George H. Morris, Diane Carney of Antioch, IL, Sue Bauer-Pinckney of Lexington, KY and Pat Bostwick of Cleveland, OH. Spectators could grab a plate of pancakes courtesy of Stoney Ridge Farm and a mimosa sponsored by The Classic Horse and Rochester Hills Tack Shop, before grabbing a ringside seat to watch the seven medal final classes. Judges Pat Bostwick, George H. Morris, Sue Bauer-Pinckney and Diane Carney. The course, designed by Scott Alder, had four options for the riders to choose how they wanted to jump them. The obstacles could be jumped as a straight line or a diagonal line, setting up for a bending line to an oxer on the backside. The track offered inside turn options and some rollback turns for riders to demonstrate their skills to the master of Hunter Seat Equitation. Jane Smith won the Open Junior Medal. The judges panel had the top riders in the MHJA Open Junior Medal return to work on the flat. After putting them through the paces, it was Jane Smith, 18, of Bloomfield Hills, MI with Parle’ who took the top honors. Smith rides with Neurice Gulino at Foxwoode Hunt Club and will be riding in the George H. Morris clinic starting on Monday. After the clinic, Smith will be heading off to the University of Michigan to study Pre-med and ride on the college team. Riding under pressure with a tent full of spectators, four sets of experienced judges’ eyes and the medal title at stake can be nerve-wracking but Smith took it all in stride. Eva Bugis won the Limit Junior Medal. 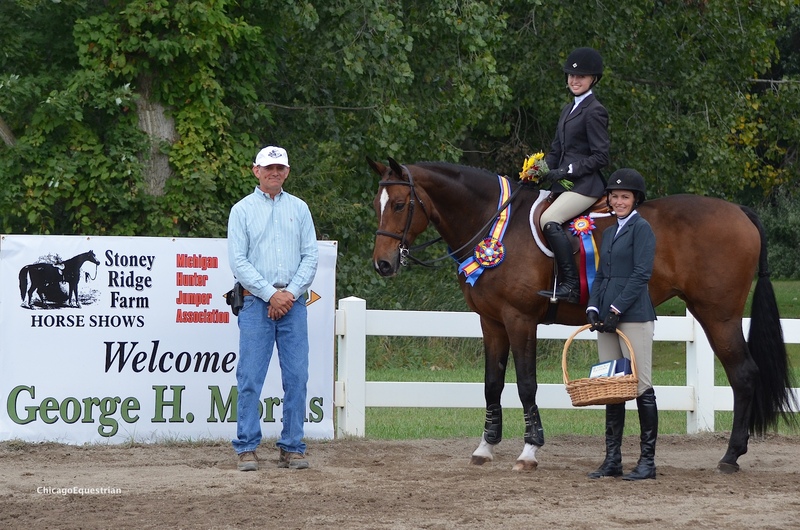 Another junior winner was Eva Bugis, 14, of Highland, MI, who won the MHJA Limit Junior Medal and rides with Scott Alder at Stoney Ridge Farm. Bugis borrowed Fortuna from Mira Mansuetti for the medal since Bugis is currently without a mount. After scoring an 85, Bugis was called in on top of the group of four finalists for further testing. The group was asked to perform a figure eight at the posting trot and at the canter. Burgis hopes to find a horse to show in the Medal and Maclay for next year and she will be auditing Morris’ clinic this week. One of the adult riders, Hilary Marx, 24, of Ottowa Hills, MI, received an 88 from the panel of experts for her ride in the MHJA Open Adult Medal. The top four riders returned for additional flat work as their test and Marx held her position in the lead for the win on Cohiba. Marx rides with Suz Bates Colon at Hunters Run. Marx rode her horse, Cohiba, who also won the Mary Bonisteel Alder Memorial Trophy for the Best Equitation Horse. Cohiba used to be a Grand Prix horse and was owned by Marx’s grandmother. They sold the horse and last year found him again at a horse show for sale and bought him back. His new job as an adult equitation horse and hunter is working quite well for him. Erin Belanger won the Low Adult Medal. Jennifer Vandernoss won the Limit Adult Medal. The day continued with more medal courses and more testing. 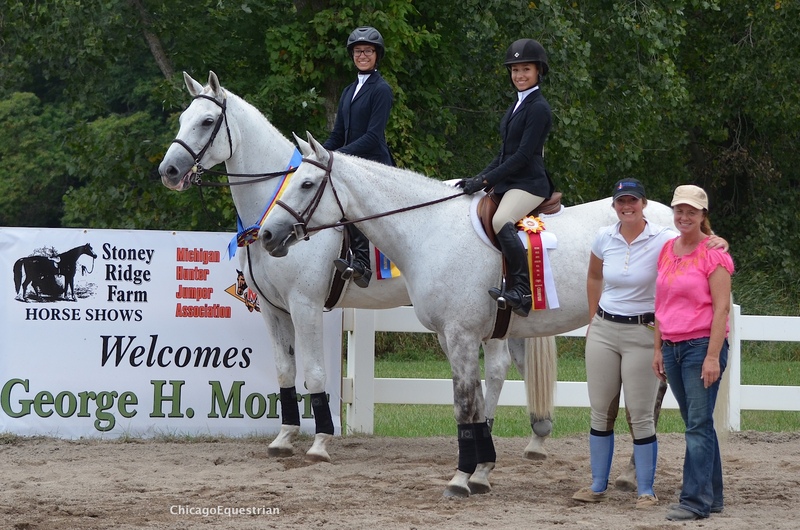 Erin Belanger won the MHJA Low Adult Medal and Jennifer Vandenoss won the MHJA Limit Adult Medal. The Hall sisters took the top two spots in the MHJA Young Riders Medal with Sophia earning the blue and Sabrina right behind for second. Sophia Hall won the Young Riders Medal with sister Sabrina in second. 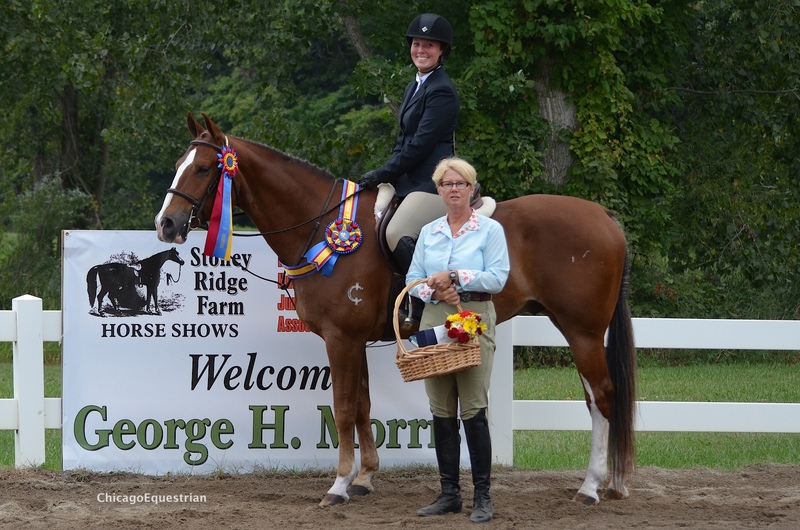 The last and the biggest class of the day with over 20 riders, was the Stoney Ridge Farm Invitational Medal. Spectators flocked the ring to watch the final test of the day. Morris and Carney asked the top six riders to enter the ring, switch horses without assistance, designating which riders were to trade horses, and riders were to jump the complete course on the new horse. It was Brandi Bohn, 25 of Highland, MI, who scored an 88 on her own horse, Match Point, and also scored and 88 on her test horse. Bohn rides with Tara Golaszewski at Hidden Hollow Farm. Brandi Bohn won the Stoney Ridge Invitational Medal. “We switched horses every weekend at the shows when I rode as a junior,” said Morris. 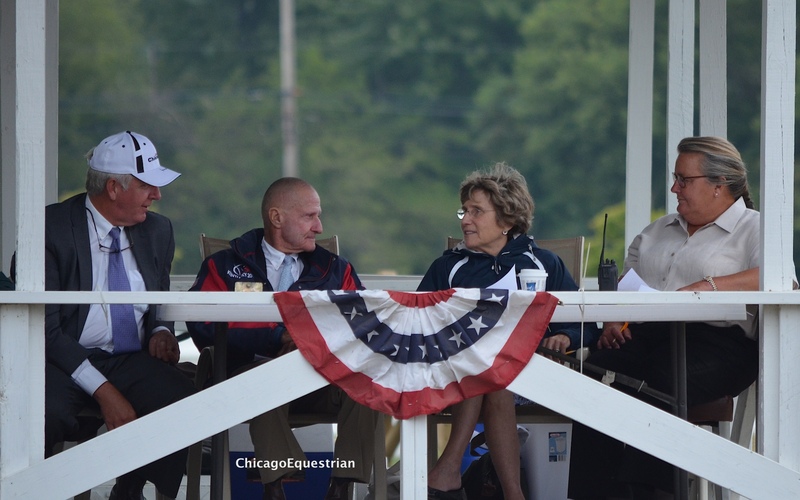 The medal riders received great prizes including a large print from photographer Diana Hadsall, Morris’ book Hunter Seat Equitation which some riders had Morris autograph, a Chicago Equestrian baseball hat autographed by Morris, flowers and more. Morris’ week continues with a three-day clinic and USHJA Trainer Certification beginning Monday, September 1st at Hunters Run Stables. 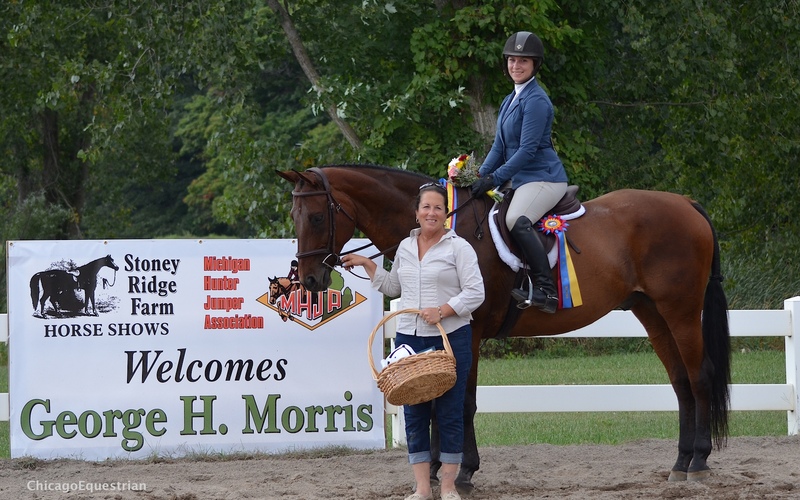 The horse show had another big feature event on Saturday with the $1,000 Stoney Ridge Farm Hunter Derby. Forty-five competitors took their turn on the Scott Alder designed course in the grass ring trying to win the top prize. It was Seaside, owned by Jordan Baker and ridden by Rachel Shearling, who won the class with the highest combined score. 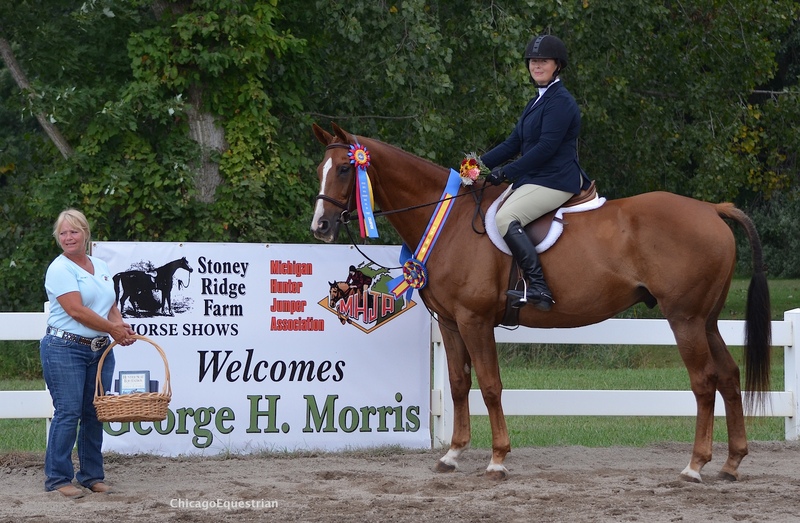 Seaside won the $1,000 Stoney Ridge Farm Hunter Derby. This class was judged using the European format. With this format, riders jumped the designated classic round, in this case jumps 1-8, horses without major faults, as determined by the judges, continued directly on to the handy round. Horses with major jumping errors in style or major faults such as a rail, missed lead change, etc., received a tone after jump 8 and those horses did not continue to the handy round but received a classic round score only, including high options. 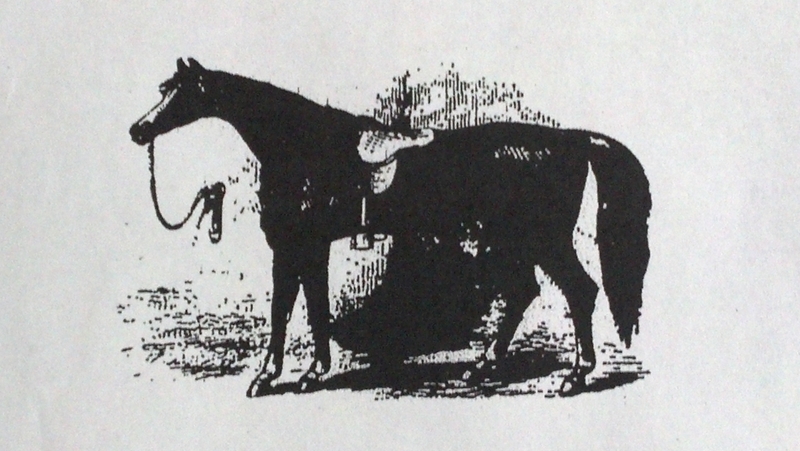 Approximately twenty horses went on to the handy round to receive a handy score, which was added to the classic score for the total to determine the winner. Spectators gathered around the ring, filling every open spot, and intently watched horse after horse tackle the derby course. Because the format allows the class to move along, spectators stayed for the entire class, cheering on their team members. “Because the derby is so popular and has a chance to someday go international, I thought of this format years ago. Coming from a European outlook, it is similar to power and speed, which Europeans already understand. Having run a class with this format, I see this structure as a benefit to any derby and it worked beautifully. The crowed loved it, the riders loved it and as far as judging, it was quite transparent,” said Carney. Morris and Carney were part of the original team that came up with the derby concept at a Chicago dinner back in 2006. “It worked perfectly and was easy to judge,” added Sue Bauer-Pinckney. All the judges agreed it was easy to judge and the results were the same as if it was run the traditional way yet saves time in preparing horses and running the class. 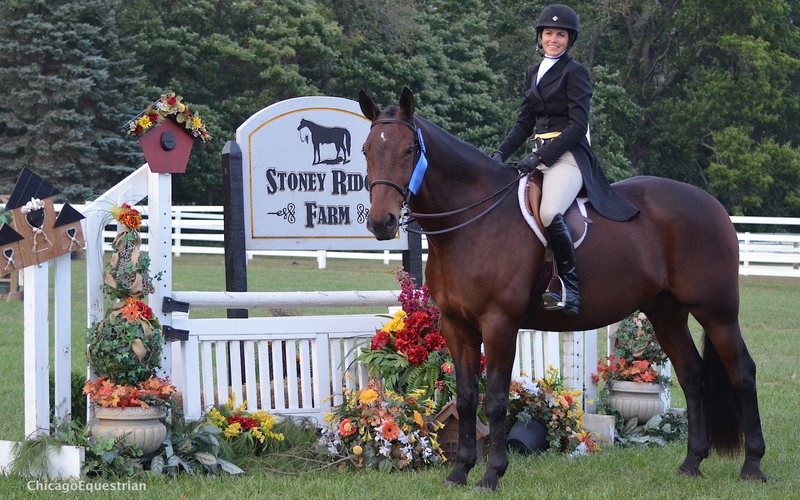 The event was another hit in the Stoney Ridge Farm Horse Show schedule. With the completion of the medal finals, the farm moves into clinic mode for the next three days. For more information on the clinic, please contact Scott Alder at 734-395-9086.